As I was looking at my calendar today, I realized they should probably rename spring the season of great design. From High Point Market, to the Lenox Hill Neighborhood House Gala to the semiannual upcoming Tabletop Market, to Design on a Dime and Kips Bay in April, there will clearly be a lot of noteworthy design news to share. And following right on the heels of all these events, at the beginning of May, is the Wakefield Design Center To The Trade Day, where I’ll be speaking with Thom Filicia about Defining Americanism, the Red Cross Ball in Greenwich with more tabletop splendor and my favorite West Coast design gathering, La Cienega Design Quarter’s Legends, where I am excited to report, I will be participating as a Legends Ambassador. They will be profiling all the ambassadors, starting with me and friend Marisa Marcontonio of Stylebeat here on their blog. AND Susanna Salk and I have a slew of behind-the-scenes videos coming so that you can tag along for the story behind the style with all the great people, places and things in the world of design. So stay tuned, I’ll be writing, shooting and editing as fast as I can so that you don’t miss a thing! This entry posted in art, design, interior design. Entry Tags: interior design Bookmark the permalink. 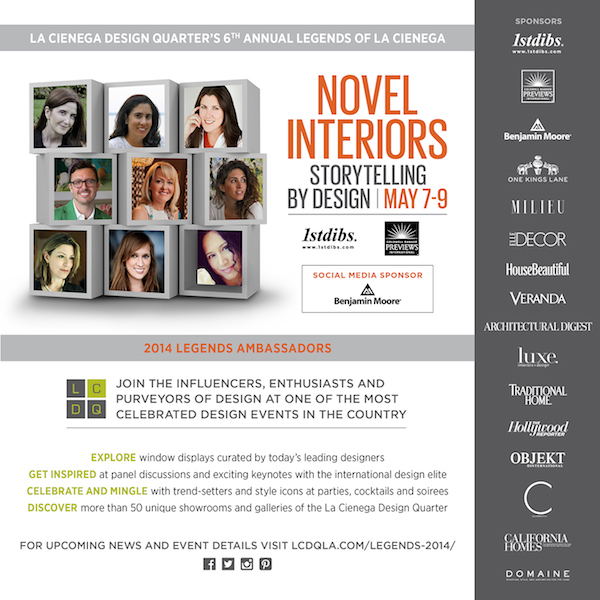 Novel Interiors, I would love to be there Stacey, a stellar lineup of design enthusiasts! Can’t wait to see the new videos and absolutely loved hearing you and Suzanna at the bloggers conference in Atlanta….you two look like you have a great time making them and that is what it is all about! 79 queries in 0.388 seconds.